Courtesy of Neon and Vice Matthew McConaughey in The Beach Bum. Years ago, living by Venice Beach for a summer, I was pleasantly buzzed with friends near the boardwalk when one pointed out a man and a woman — each with a single kitten on their shoulder — walking toward each other from opposite directions. The two apparent strangers met, briefly exchanged surprised, enthusiastic greetings, and then went their own ways. Minutes later, they both walked the opposite direction and neither acknowledged the other's presence. Ships passing. In the opening minutes of Harmony Korine's The Beach Bum, Matthew McConaughey finds a kitten of his own, a small white one with green eyes. Playing to exaggerated type as Moondog, a bedraggled but well-heeled surfer-stoner and self-proclaimed genius poet, he grants the cat more consideration than he does anyone else. Wandering about the mansions, beaches, and boardwalks of Miami Beach and the Florida Keys, McConaughey treats the film as a by-now-superfluous acting showcase, navigating the story's world with a convincing consistency (Moondog's absurd, indulgent air sits closer to, say, Borat's than Lebowski's) even as it never really finds much narrative traction. Over the film's course, he drifts between venues, residences, rehab, and court with little air of gravity, riling, pranking, and sometimes robbing without ever paying a price for it — none of which is as funny as it might be. At the risk of seeming censorious, I'll suggest some of the problem here's political as well as structural — it's not just about misconceptions in script or scene. 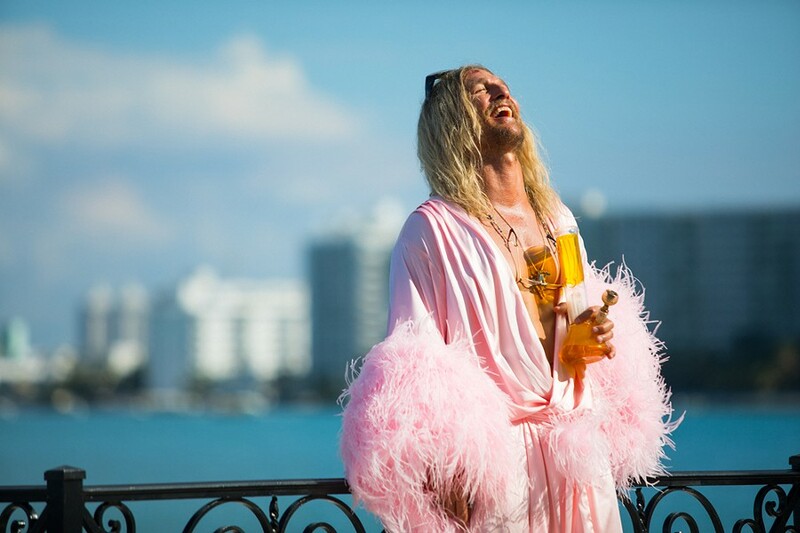 Whereas movies like Inherent Vice or The Big Lebowski depicted characters with some opposition despite their naturally copacetic (if sometimes paranoid) demeanors by placing them in situations that didn't always welcome or flatter them, The Beach Bum takes none of Moondog's obstacles seriously — in fact, they never even read as obstacles. Court orders are easily evaded and the death of a loved one is barely a blip on Moondog's radar. Orbiting his own planet with remarkable inevitability, no cuckolding, car wreck, or crime could keep him from his daily, booze-set rhythms at his typewriter, or from his indulgent pronouncements and literary quotations. Much of this seems driven by his marriage into money; "being rich," he says at one point, "you can just be horrible to people and they have to take it." Chummy with many but without any real friend (and an emotionally and mentally absent husband and father, too), Moondog scans in some ways as an archetypal, nominally chilled-out white male celebrity performer who just wants to do as he pleases. As rich as he is staggeringly incompetent, Moondog bets on populist charisma while coasting through life, making The Beach Bum's attempted ode to personal freedom or alternative lifestyles more closely recall the patterns of, say, Louis CK's, or even (and maybe especially) Trump's career rather than Kerouac's. In one scene, Korine has Moondog lead an ensemble of homeless pals to destroy his old mansion, wrecking the furniture and smashing a piano; in another, he immolates a pile of money in a dramatic public display, bringing him closer to his largely working-class spectators. Though much of the political signalling in The Beach Bum proves hazy, the subtext of these scenes is more than clear; Moondog is a man of the people and a good dude. Bohemian-by-choice has long been a lifestyle option for the idle rich, and to the movie's credit Moondog's world is a pretty well-drawn place to spend some time in, even though it drags at just 95 minutes. Populated with a mix of first-time and established performers (and extended, funny-but-obvious cameos from Zac Efron and Snoop Dogg), The Beach Bum's world is one of corncob-sized joints, cartoon shark attacks, and jaunty visual styles. Heidi Bivens' jumpsuit-riddled costume design and cinematographer Benoît Debie's use of broad, flat colors create what should be a strong, vivacious atmosphere, occasionally elevated with success to affecting montage. But for the most part, The Beach Bum's cut together and scripted in a style that feels schticky and interruptive, over-reliant on gags, and too impatient to settle into anything lifelike — the way Korine has before and that Richard Linklater used to. Those who've seen the director's Spring Breakers (which was also set in Florida) may wonder where the (mostly same) crew's sense of synergy went, what happened to Korine's sensitive eye for satire and provocation, or how his drives to explore the intricacies of race and class, as well as that movie's air of constant surprise, questioning, and opposition could have gone missing. That last movie looked at first a lot like this one, but where Spring turned left, Beach veers right — strangers passing on the boardwalk.